System Requirements: Win7/Win8/Win10/Vista on either a PC or on a Mac with the Intel dual-boot processor with Vista or Windows 7/8/10 installed. Won't run under Win XP, 2000, 95, 98, NT, ME. 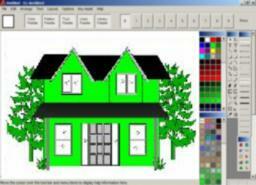 Ez-Architect for Windows is a full featured home design program. With this tool-driven home design program, planning and drawing your new floor plan in the precise 2D top view is a snap. If you'd like to download a free demo of the program that has disabled printing, exporting, and saving, click the Download Demo button. System Requirements: Win7/Win8/Win10/Vista/XP on either a PC or on a Mac with the Intel dual-boot processor with XP or Vista or Windows 7/8/10 installed. Won't run under Win 2000, 95, 98, NT, ME. If you'd like to download a free demo of the program that has disabled printing, exporting, and saving, click here. Some features of this home design program that make your floor plans easier are the duplicate tool for automatically placing rows or columns of boards, studs, trees, plywood, joists or whatever exactly where you need them�spaced on-center like you need them when you design your own home. And there's a layering system for keeping upper stories, electrical, and plumbing schematics separate. On the other hand, if you just want to create simple floor plans without any complications or layers or construction detail, this is the home design program for you! We've all seen that home design software has tended to get more complicated and has a steeper learning curve, in spite of the fact that most of us just want to create some floor plans and don't really care about learning about 3D. 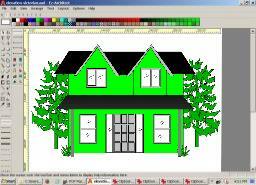 If you want the design your own home process to be easy and quick, this is the home design program for you! 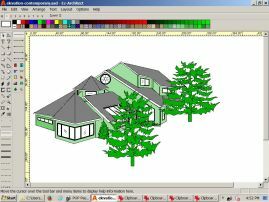 "If in need of a product that will help you better understand the structure of your future summer house or aid you in renovating your existing residence, take a look at Ez-Architect, a powerful design tool intended for creating custom design plans." You may choose from English or metric measurement units and select any scale. Easily manipulate the current color and pattern palette or create your own and save an entirely new palette. Draw your own objects with the intuitive drawing tools and store them in customized libraries. Or use the wide selection of objects that comes with Ez-Architect. 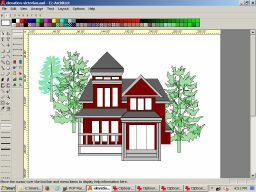 You can't go wrong with this easy-to-use home architecture software program�it's Windows Vista or Windows 7/8/10 home design at its best. There are lots of sample plans to get you started. Ez-Architect 4, 5, 6, 7, 8 owners: UPGRADE to Ez-Architect 9 here! Ez-Architect 4, 5, 6, 7 owners: UPGRADE to Ez-Architect 8 here! 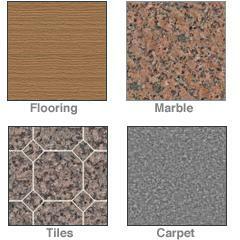 All our home design pictures can be clicked to get larger images. Check out this demo where a bedroom gets designed in 1 minute! "I bought Ez-Architect to design the interior of our home-built campervan. 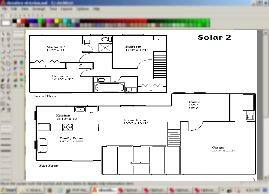 I already have a very expensive CAD system, but it is very complicated and not really suited to home plans. However, Ez-Architect was so easy to use that I now draw my husband's engineering drawings with it. It does what many more expensive CAD systems do but is much more user friendly. 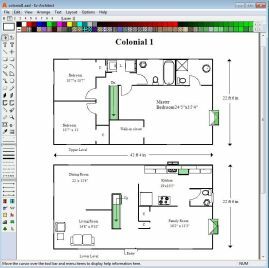 It is easy to choose drawing units, scale, add text and edit objects. It uses layers, just like the more expensive systems, and has the capability to make your own furniture and add it to the libraray. I found it so easy to draw the van floor plan to scale, make my own furniture, like the combined sink and oven hob, and drop it into the plan. Using the Ez-Architect, I was able to move the kitchen furniture around and find the optimal arrangement for our campervan furniture. So much easier than trying it with the real thing! Ez-Architect has little added extras that I find very helpful, like the line measuring tool. I have just purchased the Home and Office library and I have found the quality of the art just as good and the after-sales support excellent. I cannot recommend this programme enough. If you want a good quality CAD that is extremely simple to use, with a good in-built help, get this." "Five years ago, when I bought a new home computer with Windows XP, one of the down sides to the upgrade was the loss of my favorite drawing program, DYOH from Abricadata that I had loved on my old Windows ME computer. When I moved all my personal data from the ME to the XP machine, for some reason I moved the aig files too. I'm not sure why I moved them, and for five years they have sat uselessly on my XP machine. I just couldn't bring myself to delete them. During those five years I searched on and off for a replacement program I could use for drawing floor plans and other geometric type images. Today I tripped across EZ-Architect so I gave it the demo a try. It was just what I was looking for! In fact, all the controls seemed awfully familiar. And then I saw the Import function for old aig files and I knew I had struck gold. It took me about two seconds to decide to spend the $20 for the serial number key. I'm so glad that you have made an XP version of the DYOH program (and that I finally found it online). Thanks for producing what I think is one of the most simple, basic, easy-to-use yet feature-rich 2D drawing programs I know of. "I needed a simple inexpensive program that would run on Vista. I really only use these programs to lay out furniture. It worked great!" "Excellent program for the non-professional designer. Very intuitive. Great for do-it-yourself projects and the small contractor. The manual is well written and covers everything in simple detail. I have not tried more complex multi-layered designs, but can't see anything yet I am not pleased with. Summary: With respect to functionality and simplicity, this program is well worth the small price." "Your program (Ez-Architect) is amazing and I have a lot of knowledge about other programs of the same type. Here in Brazil lots of people have asked me to find and teach a program like Ez-Architect. And now I will." "I just wanted a simple program to draw simple projects on the computer for around the house. Then I found yours. I found it simple, basic and easy to use. Most of the drafting programs I found were a couple of hundred each. 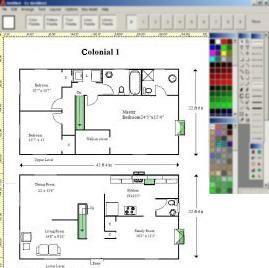 So thank you for providing an easy to use and affordable drafting program." 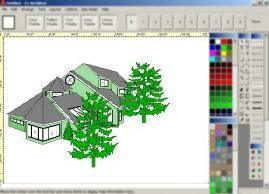 "Was looking for something ez to use with NO learning curve whatsoever and nowhere in the same league as AutoCad. Fits the bill perfectly! Am very glad to have it." 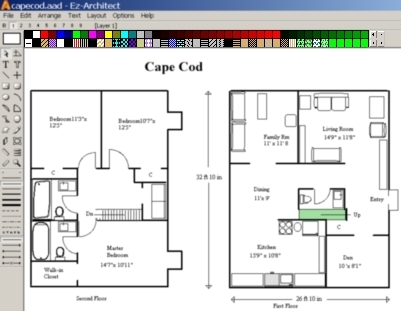 "I was looking for a very easy way to come up with floor plans. I googled it and found EZ architect. I tried it for a couple of weeks and decided to buy it. Thank you!" "Was looking for software that was very easy and quick to use and had a decent price. Just need it this one time to help figure out a floorplan so did not want to spend a lot of money. Yours was better than others -- easiest to use and a good price! Tried one called EZ Blueprint, it works fine but is very difficult to use." 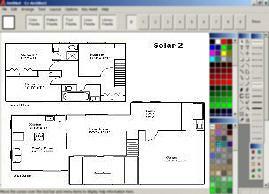 "I needed a cheap, easy, fast, usable program to make a two dimensional sketch of rooms in a new house. I used google and found it quickly. I'm very positive about the software and support." "ITS A REAL GOOD PROGRAM FOR THE PRICE, EASY TO USE. ALSO GOOD THAT IT'S FOR VISTA (WINDOWS). IT'S WHAT I NEEDED. THANKS!" 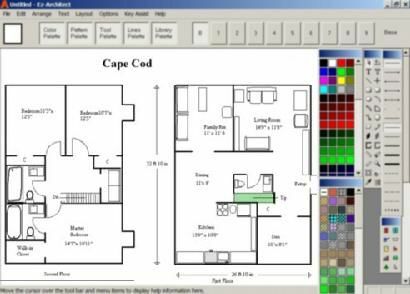 "Ez-Architect is almost like using a paint program, very straightforward, but it has all the capabilities and house parts I needed to draw up my plans. That's what I was looking for. I didn't want a 3d model or cad software." "I downloaded 3 different programs, but only liked Ez-Architect. Other 2 were free." 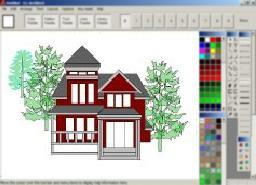 "I downloaded the demo off of a site that listed various home design programs. It was simple and the price was reasonable. I am actually laying out office space and did not need anything real technical. I like Ez-Architect!" "Rating system used by Download.com was very high for Ez-Architect, with good reports from users."